Before Sandy Hit U.S., Storm Was A Killer In Haiti : Shots - Health News Haiti had documented 54 deaths caused by Sandy — most in the nation's southern peninsula, which points toward Jamaica. Another 21 Haitians were still counted as missing, and many fear the death toll will rise as officials reach affected areas isolated by impassable roads and ruined bridges. Hurricane Sandy's tear across the Caribbean left at least 54 dead in Haiti, where many people still live in tents because of damage from the 2010 earthquake. Hurricane Sandy only sideswiped Haiti during its early days. But reports so far suggest that even this indirect hit led to nearly as many deaths there as in the U.S. after the storm made landfall on the Mid-Atlantic coast. As of Wednesday, Haiti had documented 54 deaths caused by Sandy — most in the nation's southern peninsula, which points toward Jamaica. Another 21 Haitians were still counted as missing, and many fear the death toll will rise as officials reach affected areas isolated by impassable roads and ruined bridges. "We really aren't going to have a sense of the total impact because many places are cut off," Miami Herald reporter Jacqueline Charles said on The Takeaway. The deluge from Sandy was of almost unimaginable proportions. More than 20 inches of rain drenched the southern peninsula in a 24-hour period. The natural disaster was amplified by a topography denuded of forests that were cut down for fuel. "Deaths are primarily from flooding and mudslides," Alexis Ekert of Other Worlds a non-governmental human rights organization, writes from Haiti in an email to Shots. 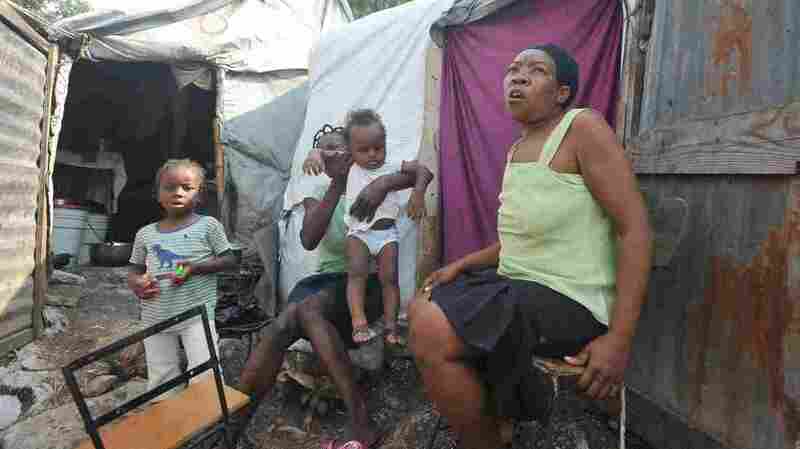 A woman and her four children were crushed when the roof of their house collapsed in the southern town of Grand Goave. "Entire towns are inundated, roads and bridges washed out," Ekert reports. Sandy has left 18,000 people homeless, according to Haiti's Civil Protection Agency. Port-au-Prince, where nearly 370,000 people still live in camps set up after the 2010 earthquake, was spared Sandy's worst effects. But the storm brought more misery as the ground turned to mud and tattered tarps let rain in. "We are hungry, things for me are bad, our tarp is torn," one Haitian camp-dweller says in this video posted by The Washington Post. But the hurricane's glancing blow will have lasting effects on a country that was already facing a severe food crisis. "There was a drought earlier in the year, then Tropical Storm Isaac," Brian Concannon of the Boston-based Institute for Justice and Democracy told Shots. "And Haiti will suffer from price rises because of the US drought." Moreover, Sandy's floods and mudslides killed many animals and destroyed both cash and subsistence crops. Banana, plantains and maize crops were ruined in the south, as was a coffee crop weeks from harvest. Officials say more than 70 percent of crops were destroyed. "It was a relatively small disaster, but it will have a big impact," Amelie Gauthier of Oxfam told The Guardian. "All it takes is the loss of one or two lemon trees and some families will no longer be able to afford to send their children to school." Health officials in Haiti worry about the floods increasing cholera's spread. Concannon says there has already been growing unrest this fall, with fairly large demonstrations each week, over high food prices and allegations of government corruption. Haiti is in the middle of an electoral crisis as well, with disputed seats in its senate, that has virtually paralyzed the legislature. "My guess is those demonstrations will pick up again," Concannon says.